by PaulEMoz in "Game Room", "Krome Studios", "Microsoft", "XBox 360", "arcade"
In some ways, it pains me to put Game Room in my top 10. Arriving with something of a fanfare and the promise of several new arcade games a week, the ability to design your own arcade and to have friends over to visit, it sounded like a retro gamer's dreams come true. Well, barring a lottery win and buying an entire real arcade, that is. Still, I bought loads of games, played them all, unlocked new stuff for my arcade and earned loads of Achievements. It seemed a bit odd that we were still only getting games from the same few companies, but everyone expected the announcement of new parties before long. And then it all went wrong. There were no new parties announced. Krome, the developer, was shuttered. Pack 13, ominously, was sent out in one go, rather than over three weeks, as had been the norm for a while. A Christmas present, perhaps? Apparently not... there have been no new releases for Game Room in 2011. And there hasn't been a single word from Microsoft as to what's going on with it. So you have to figure it's dead. Arrrr... here, there be... ducks? And the worst thing of all for me... after gaining 980 of 1000 Achievement points, and putting in around 30 hours, I was forced into an update... which completely wiped all my progress. And with the only Achievement I haven't yet won being for playing for 36 hours... well, I was too crestfallen to continue. Which is ridiculous, really. For all I've said up there, I spent a lot of money and had a lot of fun out of Game Room in 2010. And I do still own all those games, and I do still enjoy them, so I'm sure to play again over time. Even though it's a dead duck in 2011, it was good enough to be my number six of 2010. Advent Calendar - December 9th. 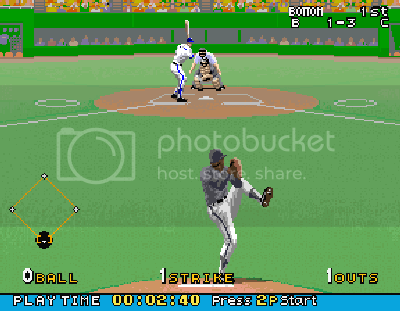 by PaulEMoz in "Bottom of the Ninth", "Konami", "MAME", "arcade", "baseball"
I've got a soft spot for baseball... it started with HardBall! on the Commodore 64, dropped off for a while then returned with a vengeance while I was living in the States. Now that I'm back in England, I like to keep tabs on the game, and I've got ESPN America and like to watch games when I can, particularly when it's the Detroit Tigers playing. Enough of the gymnastics, just throw the ball! 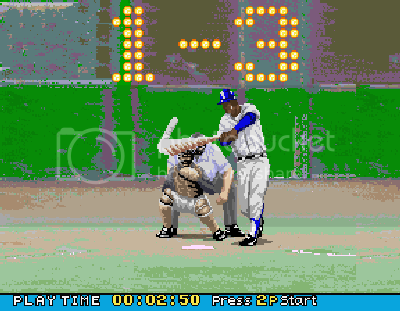 I do like videogame baseball as well... it's always difficult to play well, but you can just step up to the plate as a slugger and get in the odd satisfying hit every now and again. There have been so many efforts of varying quality over the years, but despite it being a small world these days, it remains mostly an American game and can be hard to get hold of in the UK. To that end, and despite it apparently being something of a franchise, I'd never heard of Bottom of the Ninth before. The first thing I noticed was that, for an arcade game, this is very naughty indeed. What's the first thing you do with an arcade game? You drop your money in for a credit. Normally, you'd then play until your skills meant you were beaten, at which point you'd either chuck in some more money or walk off and find another game. Bottom of the Ninth gives you ninety seconds for your 25 cents (I doubt any found their way over here for anyone to put 10p into). Ninety seconds, in a game that lasts nine innings? What a rip-off! But I suppose it's the only way they could make much money... baseball games can last ages! No point chasing that one... it's gone! I would imagine that there are ways in which you can win extra time, although I didn't see any evidence of that while I was playing. The game itself is relatively simple, but it's possible to get into it to the point where you can't help adding more credits. That's easy enough to say, though... playing on MAME, you've effectively got an arcade machine set to free play. But although 1989, the year this was released, wasn't a vintage year for arcade games, I'd probably have preferred to save my cash for other games in the arcade than blow it all on this. As for the game itself... it's baseball. You get a turn batting, where you get three outs, and then you get a turn pitching, where you have to get three opposing batters out. There's very little strategy involved... less even than the classic HardBall! But it's presented fairly well, and there's always a thrill in any baseball game whenever you belt the ball out of the park for a home run. 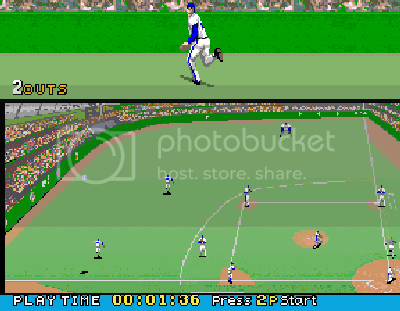 Bottom of the Ninth is an arcade baseball game, simple as that. 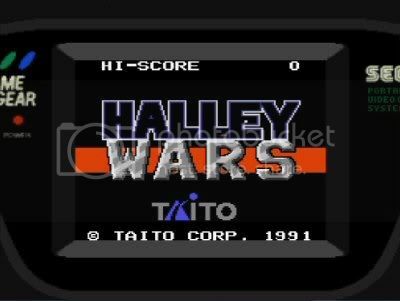 I enjoyed my time with it (all two matches worth), but it's utterly disposable and less than memorable, and if I fancy playing an old basebal video game, I'm more likely to go back to HardBall! than this one. by PaulEMoz in "Gradius", "Hydorah", "Locomalito", "Nemesis", "arcade", "shmup"
I can't remember where I read about Hydorah. It doesn't matter. All that matters is that I have it, and I can play it. And you've probably never heard of it before now, either. You're probably at a complete loss as to what I'm talking about. So I will elaborate. Hydorah is the best arcade game you've never played. 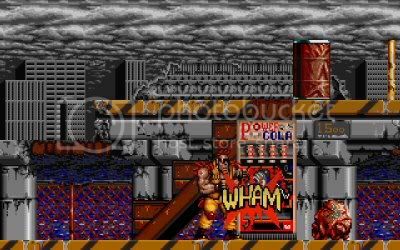 You've never played it because it wasn't actually in the arcades. But from just one play, you'll feel as though it should have been. You'd have ploughed countless tens into it, and come away bruised but satisfied. Just like you did with most of the best arcade games. It all looks quite sedate here. Aren't the trees pretty? At this point, I should actually describe the game. It's Nemesis. 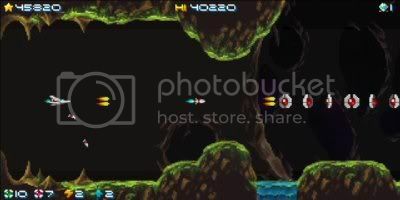 Or Gradius, if you prefer. That's the core (haha! See what I did there? ), although it's got a few bits of R-Type in there too, but yes, it's pretty much a new, independent entry into the Gradius series. And it's absolutely awesome. The programmers have deliberately made Hydorah as 80s as possible. And they've done a stunning job. It looks, sounds and plays the part to absolute perfection. That means it's hard. Very hard. It's sixteen levels of arse-kicking. Well, they say it is... I haven't seen a quarter of them, if that's the case. But it's not unfairly difficult. I knew what I was doing wrong every time, I was just too rubbish to cope. Eye-eye! What's going on here, then? In fact, if anything, Hydorah is quite generous with its difficulty. There's never too much filling the screen, there's no harsh collision detection, no cheap deaths. Just a feeling of "next time, I'll do better". It's a bit naughty in one way, I discovered... shoot the wrong stuff, and you'll lose points. Again, it's not done in a cheap way... if you think about it when you're playing, you should know better. It does have a bit of a weird weapons upgrade system, which might be a detraction for some. You collect tokens, much like in Gradius, but you can't instantly "spend" them on stuff... you have to accumulate a certain number of them, and once you have, your lasers are powered up. If you die, you lose some of your tokens, setting you back a bit. It does all look a bit familiar, but comfortingly so. 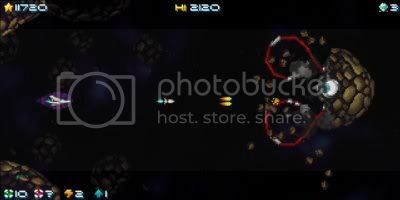 Hydorah is a really lovely Gradius-type game. It looks and sounds absolutely superb, and it plays like an 80s dream, and I don't mean that in a bad way. I guarantee that if you have any kind of love for these kinds of games, you'll lose best part of your first afternoon with it, and will re-develop that long-lost trigger finger cramp. Best of all? It's absolutely free. There's no reason not to play this at all. So head over to developer Locomalito's website, and download Hydorah right now. by PaulEMoz in "Bomb Jack", "Commodore 64", "Elite", "Tecmo", "Tehkan", "ZX Spectrum", "arcade", "fight"
Here's a feature I thought would be a good idea, that would tap into our schoolyard memories and provoke, erm, "discussion"... ZX Spectrum vs. Commodore 64! We've all had those arguments as to which is better... and I felt like stirring the pot a bit more. Just for argument's sake. The first game I chose was Tehkan/Tecmo's Bomb Jack. OK, so it's an arcade game, and that being the case, why did I choose two no doubt inferior versions to look at? Even stranger... 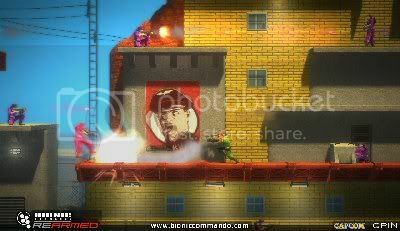 Bomb Jack is not a game I have any particular love for. I've never been any good at it, and I find it quite frustrating. And yet, I've subjected myself to it... twice. Here's what we started with... lovely, juicy bombs. The arcade game is actually quite nice. It's pretty enough... bold and colourful, with those lovely red cherry bombs hanging in blue skies. To get the best scores, you have to collect the bombs in order. Once you collect one, the next in the sequence will start flashing. That's the one you should go for. Collect all the flashing bombs and you'll receive a big points bonus. It was never a favourite of mine; I never was any good at it. 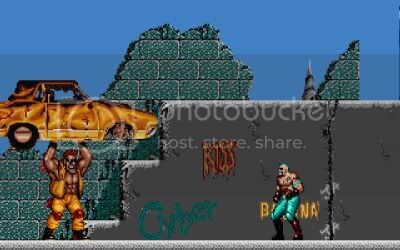 Playing it in MAME these days has given me a new appreciation of it... skilful play can see you weaving in and out of enemies, and it can get pretty intense. And of course, there's the risk/reward aspect of collecting the bombs in order for bigger points. It's a classic name, and in retrospect I would say rightly so. Bit naughty, putting all that red in the background. Where are the bombs? 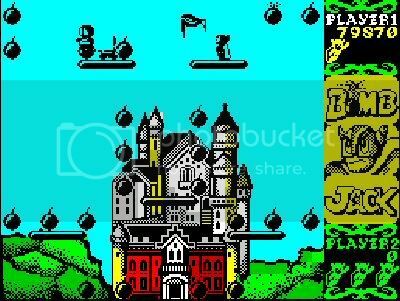 I had Bomb Jack on the Commodore 64... I did play it a fair bit but it was annoying. It wasn't well reviewed either, generally speaking. I'd also heard that the Spectrum version was really good... something that's stuck in my mind all this time, and partially led to this little feature. Playing the 64 version again just brought home all its faults, but magnified this time. Jack's a fat lad, for starters... and oddly, you can actually feel the weight! Jack seems to drop more quickly than in the arcade version, and also seems to struggle to get his lardy backside off the ground. 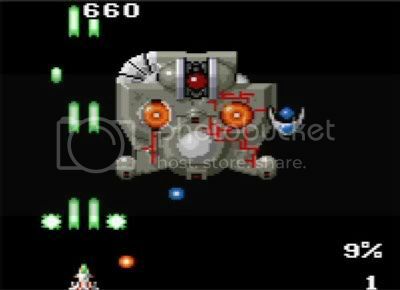 The enemies are all bigger too, but it's more than just a cosmetic problem... this extra size makes the screen very cramped, and it's very difficult (if not impossible) to manoeuvre around for the bombs. It's fast... but that's also a problem, given the size of everything. Also, bonuses are very hard to come by, which is annoying... and then you find out the game has a completely different (and lower) scoring system to the arcade version. 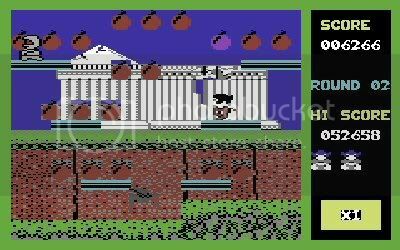 Bomb Jack on the Commodore 64 is not very enjoyable. That bird's nothing but trouble. One peck, and you're dead. Having re-acquainted myself with the Commodore version of Bomb Jack, it was time to try the Speccy's effort. And the first thing I noticed was the size of the game's characters... they're small. Thankfully! When I say "small", I mean "just the right size". The game is perfectly playable on the Spectrum. 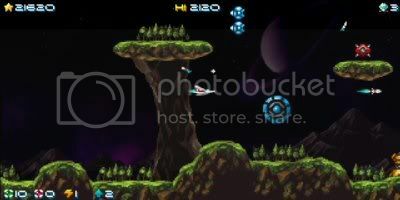 Gaps can be squeezed through, enemies can be dodged, bombs can be collected in order, bonuses can be had. And the scoring system is the same as the arcade version's. Graphically, it's one of the nicer Spectrum efforts I've played so far, with colourful backgrounds and no sign of clashing. Nice work, Elite! The home versions had a problem from the start, in that Bomb Jack in the arcade has a vertical monitor, and these versions had to be squashed hozizontally. One version coped with this far better than the other. 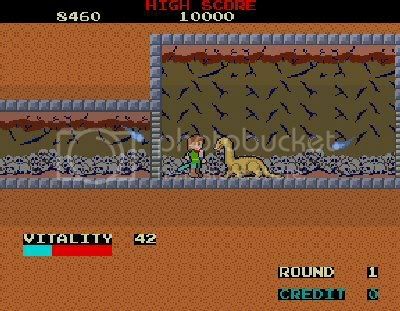 I had quite a lot of fun with the Spectrum version of Bomb Jack. 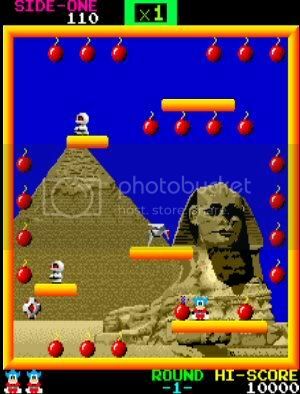 It's a very well implemented version of the arcade game, with precise controls and accurately-proportioned graphics. It seems as though they really took the time to lay out the screens with the horizontal aspect taken into consideration. The 64 version, on the other hand, doesn't work all that well. It does have nice red bombs, although they're more blood red than the big arcade cherries. But the poor scoring system and claustrophobic playing area really cripple it, and it's not really worth much time. 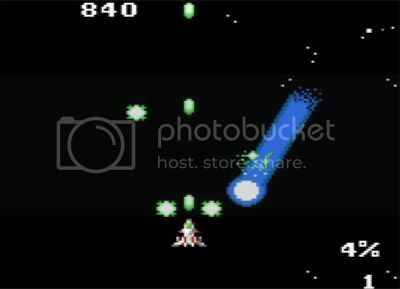 by PaulEMoz in "Galaxian", "Namco", "arcade", "shmup"
Today is my dad's birthday, so in a tribute to him, I thought I'd play what is probably his favourite game ever: Galaxian. Surely the whole of the Developed World knows Galaxian. It's one of the most established classics we have. And it hasn't just died away - Namco has kept it alive on every format known to man through their Museum collections. 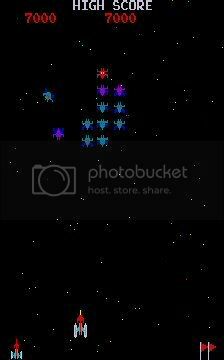 That said, it's taken something of a back seat to its sequel, Galaga, which many prefer. 7000 points. That gets you an extra ship. That'll come in handy. For me, Galaga over-complicates the formula. With its attack patterns, dual-ship capability and challenging stages, it throws a lot more into the pot. And it's a good game, there's no doubt about it. But I think it takes the swoopy-swirly aspect of the alien attacks too far, leading to much frustration at times. Galaxian, on the other hand, is as pure as arcade gaming comes. It's just you, with your ship and its single laser, against an enormous alien force. That's it. The parameters never change, and eventually they're going to force you into a mistake and you'll die. It's inevitable. Survival relies on you getting into The Zone. Galaxian was probably the first game I ever played where I got into The Zone, at the age of 8. It's probably the game most responsible for me loving videogames now. 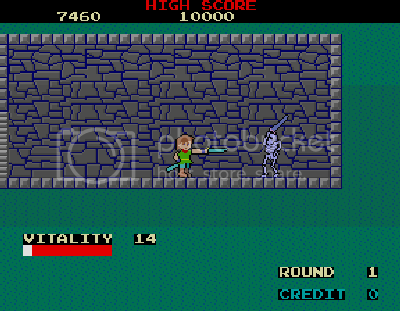 And for me, it's still as enjoyable as it was when I played it in the chip shop in 1980.
by PaulEMoz in "Dragon Buster", "MAME", "Namco", "Rastan", "Wonder Boy in Monster Land", "XBox 360", "arcade"
There are a lot of games on the latest version of Namco Museum. Pity the interface is rubbish, because it puts you off playing any of them regularly. But this blog is not about regular; it's (mostly) about playing games that I've never played before. And there are a few on this compilation that I can say that about. Before today, one of them was Dragon Buster. Pity that's not still the case. Oooh, where to go, where to go... I'd rather just go home, actually. Dragon Buster is basically a rubbish cross between Rastan (which isn't that great to begin with) and Wonder Boy in Monster Land (which is). You wander around subterranean passages and get attacked by ghastly monsters. I say ghastly... they really do look horrible, but only in a drawn-by-a-five-year-old way. For 1984, these are terrible arcade graphics. Hey you! Yes, you! I put it to you that you are a rubbish skeleton! As far as the game goes, I suppose its ideas outstrip their implementation. You have a world map, with choices of route, which was probably fairly novel at the time. It's just unfortunate that, whichever choice you make, it sees you wading through a sea of cack gaming. It's usually a case of walk right, stop, do a Pete Townshend swing with your sword at a rubbish animal, and move on. Occasionally you might do something exciting, like drop off a ledge or something, but that's your lot. Every so often you'll come across a pathetic looking dragon, which you can smite with just two hits. There are bigger, much more impressiver dragons to be slain, but not a lof ot skill involved. You're a dragon? Really? You're cute. Wanna be my pet? And there we have it. Dragon Buster was, research finds, pretty well thought of in Japan, with conversions to home platforms, sequels and even a board game! I find that a bit odd... it's really not a particularly good game at all. I doubt I'll be loading this one up much in the future. 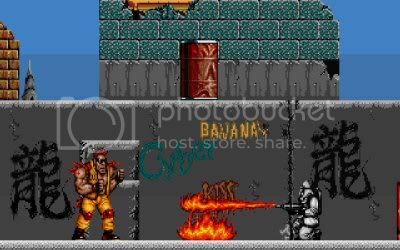 by PaulEMoz in "Legend of Kage", "MAME", "Ninja Spirit", "Shinobi", "Taito", "arcade", "ninjas"
This might seem to be a bit of a left-field, from-out-of-nowhere choice, but there's a reason I'm playing it, so stick with me! The Legend of Kage is not a game I ever saw in an arcade. The only reason I'd heard of it previously was when I read a review of the Commodore 64 conversion in ZZAP! 64. They seemed to think it was distinctly average, and I didn't bother hunting it down for a play. Fast-forward, oooh, donkeys years, and I find myself playing it in MAME. And it's alright, actually. A bit odd for an arcade game, perhaps... although thinking about it, it plays a bit like a precursor to Shinobi, which I have certainly enjoyed quite a bit over the years, or maybe Ninja Spirit. Ugh! Get away! Get awaaaaaay! 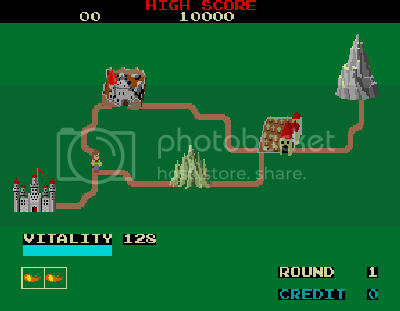 Typically, the game starts with a princess being captured, and you drop into the scene to chase after her. As you would expect, ninjas fly about, chucking pointy stars at you. Luckily, you can throw stars of your own, and you have swords for dispatching anything that gets a bit close for comfort. You're also possessed of an implausibly mighty jump. 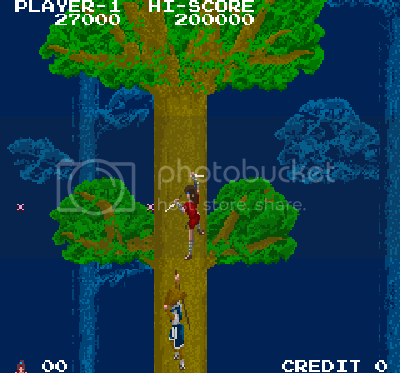 This game sees you flying around in treetops a lot, with the ninjas whizzing by all around you. It's quite good fun, if a little strange. 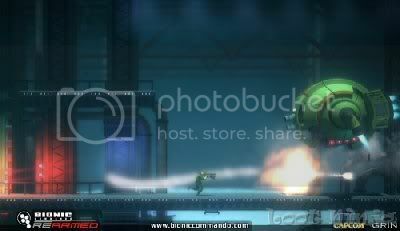 Other enemies appear through the game, including fire-breathing Raiden-types, just to mix it up. 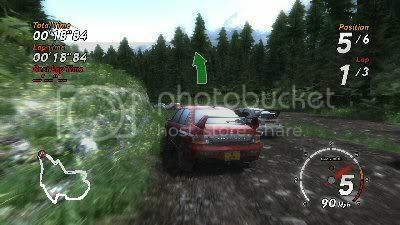 by PaulEMoz in "360", "Sega Rally", "XBox", "arcade", "racing"
"Hold on a minute! ", I hear you cry. "Sega Rally isn't an unsung classic!". And, it's fair to say, the original game is a classic that's loved by many, many people. The modern reboot, on the other hand, although critically praised seems to have come and gone in the blink of an eye, with few people giving it the time of day. What a shame that is. The new Sega Rally is an absolutely brilliant arcade racer, full of all the classic Sega touches that you'd expect. Wildlife wandering around on the safari courses. Flying vehicles on different courses... planes, helicopters, microlites and hot air balloons make appearances here. But there's far more to this game than little cutesy cameos. Sega Rally is brutal. As racing games go, this is one of the hardest I've played. But it's also very fair and very true. In many of today's racers, you can just plough your way to the front and stay there, battering meek opponents out of your way and then cruising along as they drop back out of harm's way. That ain't happening in this game. No, this game will challenge and fight you, every step of the way. You have to earn everything in this game... and I don't just mean race wins. You'll find yourself locked in a struggle to keep fifth place, and in a race of six drivers, that's saying something. Sega has set this game up so that every point counts for something, and it can actually feel really satisfying to finish in the top three. Ooh, fourth place is within reach! Grab it! The AI is nasty. Opponents aren't afraid to give you a good whack if it means retaking their place from you. And when you bear in mind how difficult it can be just to drive each course in a reasonable time, you'll find yourself cursing them any time you do that. The environment also plays a part in your driving. Muddy courses will become rutted as they're driven on, and hitting these ruts on your next lap will slow you down or throw you off course. Pools of water will really slow you down. Sliding from gravel onto tarmac, you'll really feel the tyres bite. Sandy courses feel... "smushy". You'll feel bogged down in deep snow. Everything affects your car as you'd expect it to. 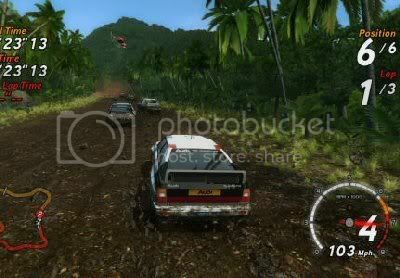 Sega Rally is possibly the most difficult racer of the modern generation. But it's also the most gripping, to my mind. 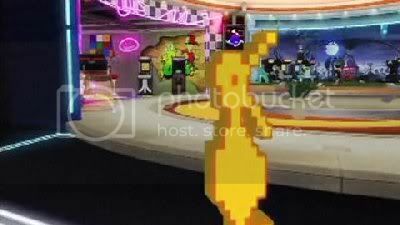 It's a game that you have to play in a room by yourself, because you get so into it. You'll find yourself regularly in that ridiculous position of trying to coax extra performance out of your car with your own body... leaning forward at times, or with your hands thrown way out to the side as you try and clip just a little off that tricky corner. It's absolutely intense, and there's not a lot of that around in today's games. I bought this a couple of years ago, for about a tenner, and I'm still coming back to it. 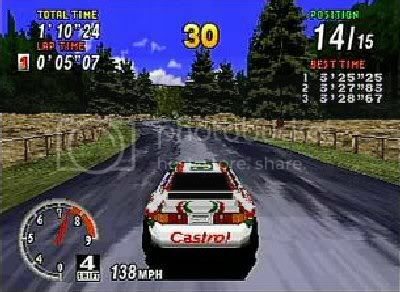 It's no more expensive than that now, and if you find yourself yearning for the good old days where games would give you a good kicking but lure you back for more, you really owe it to yourself to buy Sega Rally. 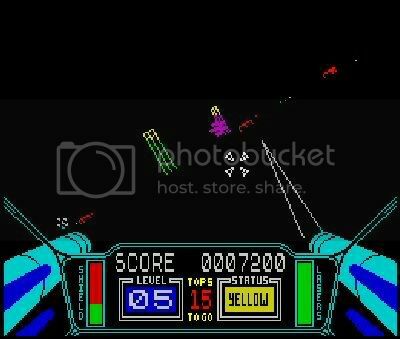 by PaulEMoz in "3D Starstrike", "Sinclair", "Star Wars", "ZX Spectrum", "arcade"
This might be a short post, because there's not that much I can say about it. You see, 3D Starstrike is, almost lock, stock and barrel, Star Wars. And who doesn't know Star Wars? Shoot the TIE Fighters, shoot the towers, fly through the trench... we've all done it. 3D Starstrike does have a few differences, probably so they wouldn't lose the court case in three seconds flat, but at the end of the day, it's Star Wars. The towers shoot flowers. Big, deadly flowers. Still, there's nothing wrong with that. Star Wars is great, and this was released in the days when clones were massively prevalent. Certainly, they were accepted as par for the course. 3D Starstrike is a good Star Wars game. I enjoyed playing it quite a bit. It's certainly better than any Star Wars game I played on the Commodore 64 back then. 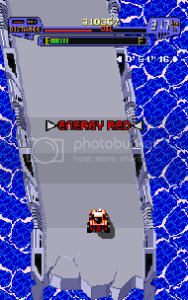 It moves at a fair old lick, and speed is essential in an arcade game of this type. It plays well, and it's a lot of fun. Good on ya, Speccy. by PaulEMoz in "AM2", "AM3", "Isle of Man", "Manx TT", "Sega", "arcade"
Sega have been responsible, basically, for every arcade racing game I've ever loved. From Turbo in the really early days, they went on to produce (among others) Hang-On, OutRun, Super Hang-On, Power Drift, Daytona USA, Virtua Racing, Sega Rally... and then eventually they came full circle and released OutRun 2, and OutRun Online Arcade on the XBox 360. 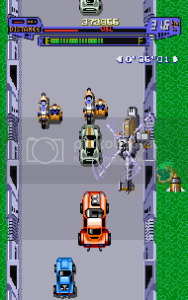 There have been other racers from other manufacturers... Chase HQ, Roadblasters, Ridge Racer... but I've either not been that grabbed by them or simply, as in the case of the Ridge Racer series, never played them. So, Sega have held me captive for about 30 years now. But one racer they released and that I'd never seen, let alone played, is Manx TT Superbike. It's an odd one, is Manx TT. I'm intrigued as to how this was given the green light. I can't say I know how popular the Manx TT road race is in Japan, but although I would have thought the answer would be "not very", it must have a decent following for a Japanese studio to go to the trouble of releasing an officially licensed game. You need to be quick, but clip that wall and you'll be sorry. Once you've got over the initial shock at the setting (and the eerie similarity of the announcer's voice to Stimpy the cat), in the arcade mode you have a choice of two courses on the Isle of Man: Laxey Coast (Easy), and the more difficult Manx TT course. No choice of bikes... you have to take what you're given. If you play in Saturn mode, there's a choice of bike and a bit more depth in the gameplay. Depth isn't that important, though. What's important is fun, and sense of speed. And Manx TT delivers both, although not in as great a quantity as Sega Rally. It really is quite thrilling, though, to be tearing through traditional British countryside* in a worldwide-released video game. It's definitely a game to be played in short bursts, though. Like the majority of high-score games or arcade racers, you want to get in, make your mark and get out. You wouldn't play it for two hours at a time, but you would come back to it for a quick blast again and again. I'd certainly have been happy to have had this in my Saturn collection in the Nineties... it's not as impressive to me now as it would have been then, and although it doesn't have quite the appeal of Sega Rally, but it's a good little racer, nonetheless. *OK, the Isle of Man isn't strictly Britain... but it sure looks a lot like traditional British countryside! by PaulEMoz in "Bumping Buggies", "Burnin' Rubber", "Capcom", "LED Storm", "MAME", "Mad Gear", "arcade"
A bonus game today, as my missus is watching some cack on the telly that I'm not interested in. I only have the laptop available for gaming, so I've gone back to the arcades for a blast on LED Storm. Or Mad Gear if you prefer - I don't, I think that's a rubbish name. LED Storm is a futuristic update on the Bumping Buggies/Burnin' Rubber style of game, which sees you racing against other cars and obstacles over dangerous courses, in a kind of crazy Cannonball Run affair. You can smash other cars into the sides of bridges or canyons and destroy them, although this is a bit dangerous as they will bounce you back. Safer is the option to jump on them... but jumping brings its own problems, as many of the bridges have huge sections missing. Of course, you have to jump over those to safety, but if you're mid-jump in an attempt to smash an opponent, you're knackered. There are other reasons to jump... bonus balloons float by, giving extra points for your score, but more important than those are the energy cans that you can collect to prolong your game. Occasionally, you'll see a green canister floating by... jump for this and you'll receive a shield for a limited period, at which point you can just barge everything out of the way. LED Storm is a game that was well reviewed on the Commodore 64 and Amiga, but I don't think I played it. I have a vague idea that my mate may have bought it for the Amiga, but it's not in my games pile so I'm not sure. It's a pretty enjoyable game, and playing it and then writing about it has seen off the TV cack quite nicely indeed. I can see it being frustrating for some, due to the slightly trial-and-error nature of the jumping, but I'd have been happy to see this arcade machine in any of my local haunts.